When my wife and I did some shopping at Costco several days ago, one of our objectives was to re-stock our freezer with meat. 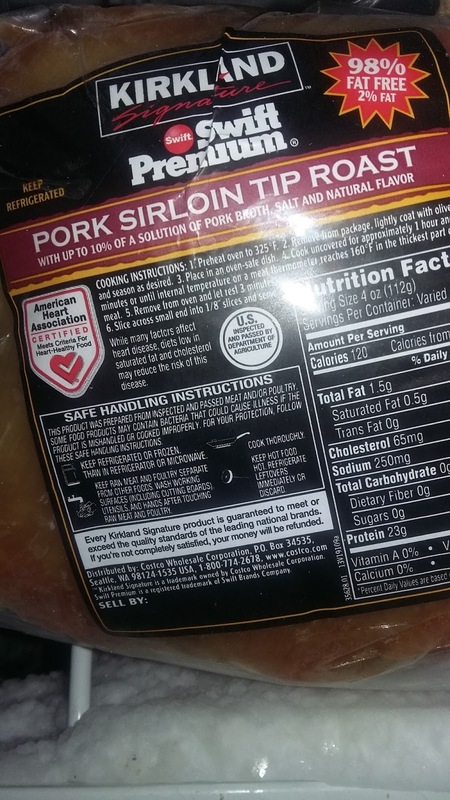 This included finding items we could prepare in our slow cooker so, when I came across a 4-pack of their Kirkland Signature Swift Premium Pork Sirloin Tip Roasts, I didn't hesitate to throw them in our cart. There were two reasons for this purchase. The first is roasts are easy to make (especially in the slow cooker). The second was the $1.75/pound price was very reasonable, essentially giving us four meals (plus leftovers) for less than $20. And, after trying one of these a few days ago, I have to say I was very pleased with our purchase. To tell you the truth, I'm actually not a huge fan of pork roast. Yes, it is convenient. But, more often than not, the roasts we purchase come out tough and dry and just aren't overly enjoyable as a result. This roast, however, was definitely different. The one my wife ended up preparing was tender and juicy. For the first time I can remember, I didn't feel as though it needed gravy or barbecue sauce, something that has helped me eat plenty of roasts we've purchased before. The pork sirloin roast was also very filling. It didn't look that large. But, there was enough for all of us to have our fill and enough leftover for 2-3 more servings. The fact I was able to have this for lunch the next day did add some value to our overall purchase and, since we have three more in our freezer at the moment, I know we are set for a while. Final Opinion: This was an affordable meat choice that turned out to have higher quality than I was expecting it to. I would recommend it as a result.